Exclusively available from the publisher. I'm delighted to report that my biography Perilous Journey written by Steve Pilkington over a three year period is now finished and can be pre ordered by following this link. My dear friend Del Newman has kindly written the Foreword, and those that have pre ordered it say that it will make an excellent early CHRISTMAS present! The first 100 ordered will be signed by Gordon on a dedicated signing page bound in to the book. Please note: For logistical reasons it will not be possible to include personal dedications along with the signature. Guitarist Gordon Giltrap is the epitome of what is often referred to as a ‘musician’s musician’, in that the respect in which he is held by his peers speaks volumes for his ability and influence. 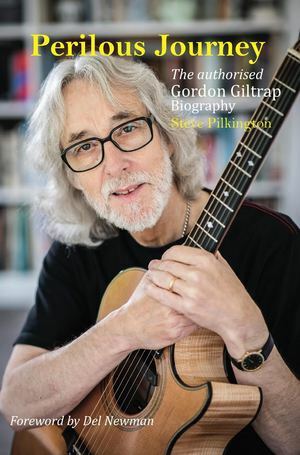 Beginning his career as a solo acoustic guitarist and vocalist in the late 1960s, it was 1976 before the name Gordon Giltrap came into the public eye with the release of his landmark album Visionary, and album and single chart success followed over the next few years with the albums Perilous Journey and Fear Of The Dark, as he formed The Gordon Giltrap Band to perform these progressive rock-tinged works in the live environment. By now a wholly instrumental performer, his greatest commercial success came with his signature piece Heartsong, which followed up its chart success by being picked up by the BBC for use as the theme tune to their long-running Holiday programme. Following this, Gordon retreated largely to the acoustic realm with his next few albums, and retained a devoted hard-core following, as well as the aforementioned admiration of some of the biggest names in modern guitar music. Coming from the humblest of childhoods in South East London, Gordon’s life in and out of the spotlight has proved to be a rollercoaster of highs and lows and one which ultimately transcends even his musical achievements as a story of human triumph and tragedy.